The film adaptation of the popular video game franchise Warcraft will hit theaters on June 10th, and as has become the norm with blockbusters, the film’s pre-release campaign includes a lot of influencer marketing. In order to harness the star power of the YouTube community, Warcraft producer Legendary tapped Portal A to develop, direct, and produce a huge game of capture the flag, with more than 30 creators participating. The campaign’s 32 players were split into two teams named after Warcraft’s Alliance and Horde factions. 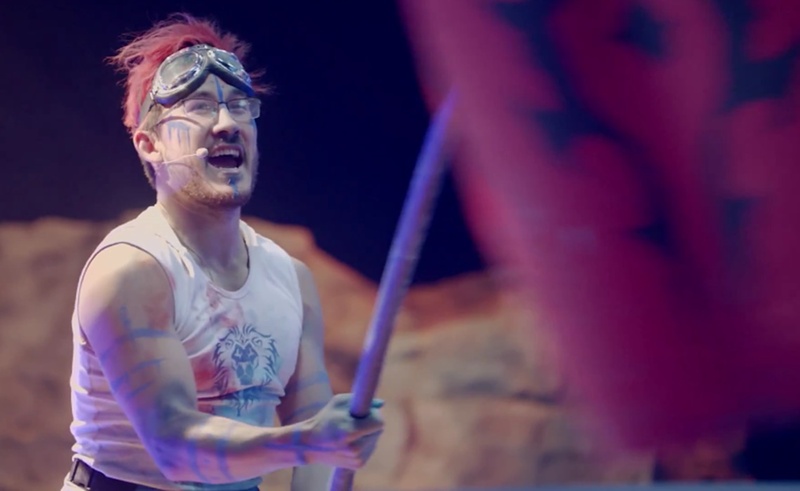 Led by respective team captains Markiplier and iHasCupquake, the two factions did battle by lobbing paint bombs at each other across a large arena built by the aforementioned Portal A in collaboration with Two Bit Circus. The full play-by-play of the showdown can be seen on Legendary’s YouTube channel. While Legendary is best known for its film business, it also controls a thriving digital empire thanks to its acquisitions of properties like Nerdist, Geek & Sundry, and Smart Girls at the Party. For that reason, don’t be surprised to see some more Warcraft campaigns pop up on YouTube in the days leading up to the film’s theatrical debut.